Salem was a hot bed of secrecy. Three museums smuggled art treasures and artifacts into their museums, escaped gentlemen from the south scurried to freedom, goods moved underfoot to the stores, men roamed to the brothels, murders escaped, and men where shanghaied through the tunnels. This is all known. I have touched on the one railroad above, but what about the real one in which had ..something to do with where the Choo-Choo go. The old wooden Salem Depot was built in 1838 after tearing down the old corn mill. This site in 1636 was the location of the first English Port House which collected Customs in. In 1664 the first corn mill was erected next to it. The Granite structure was built in 1847. The stations sat at the corner of Washington and Norman streets where Riley Plaza is now. The Eastern Railroad started in 1836 with famous smuggler George Peabody as their owner. His house is now the Bertram House for the elderly on the Common’s. Famous authors would leave his home through the tunnels to read at the Lyceum. In 1839 an open tunnel was built in the center of Washington Street for the trains to run through. The Old Court House which was used before as the 4th Town House in Salem was torn down to make way for the tunnel. It was on the site in which the men and women were tried for witchcraft on. Also in this building John Hancock held the First Provincial Congress in. The Eastern Railroad was absorbed by the Boston and Maine Railroad when they started leasing their tracks in Dec. 1884. Leading west from the station up Washington Street the train ran. To the East of the tracks there was a row of buildings which have long since been torn down. The present sidewalk in front of the Eastern Bank and Daniel Low’s was an alley that ran behind these buildings to Front Street. Before the tunnel could cross Essex Street it became covered and ran to the Tabernacle Church on Federal Street. The basements of Red Lion Smoke Shop, Frye’s Building, and the Kinsman building had tunnels leading to them. The original buildings which used to be on top of these foundations are gone (except the Kinsman which was built on a lot which housed two homes in 1882), but their tunnels remain. Train Tunnel heading toward Station. Just long enough to hide one train. Train Tunnel was covered to ease traffic on the busy intersection of Essex and Washington??? John Kinsman originally owned the Salem Car Company which manufactured rail cars. The location of his company is where the Brake and Clutch shop is on Bridge Street. He would sell the site to the Eastern Railroad and become their superintendent. He would hold this position from 1842-1855. His office was in the granite train station. He would also buy the property that ran along Collins Street from William Parker, Parker Brother’s father, to build a rail to connect that site to the tracks that ran along Web Street. Parker was also a fellow smuggler and neighbor for Kinsman lived in front of their house on Parker Court. The Eastern Railroad would use the lot to fix their cars. many of the homes in the area were built for railroad employees. In 1844 John Server founded the Old Colonial Railroad that ran from Boston to places south like Plymouth, Fall River, and Providence. By 1848 it was added to the smuggling project in Salem. Elias Hasket Derby III becomes their president. In 1850 his cousin Francis B. Crowninshield takes over the position till 1854. 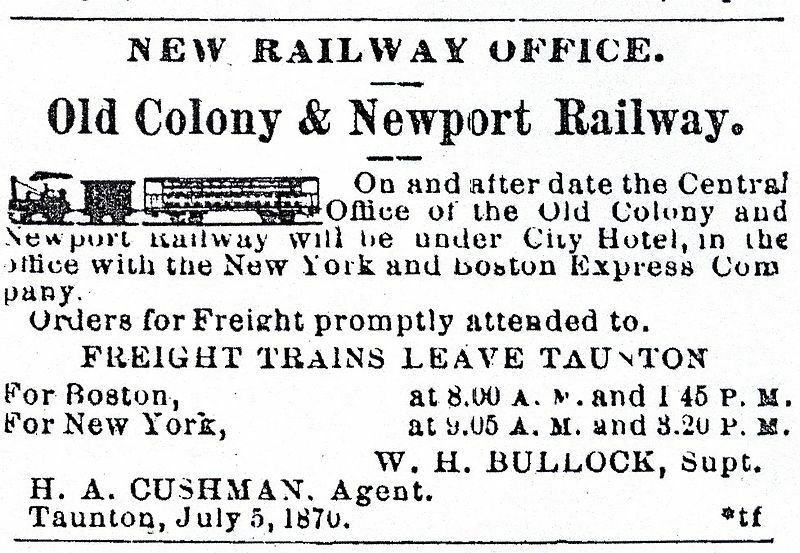 So once the Eastern Railroad entered Boston goods could continue south on the Colonial Railroad. From 1877 to 1894 Charles Francis Choate Sr. was president of the Colonial Railroad. Previous he was the lawyer for the Boston and Maine Railroad and Old Colonial. Elias Hasket Derby III was the previous lawyer for Old Colonial Railroad before he became president as well. He married into the Manning and Hodges family when married Margaret Manning Hodges. These families were some of the original 159 Subscribers of the Salem Common Improvement Fund created by Elias Hasket Derby Junior in 1801 to hide his tunnel expansion project behind. The Hodges are cousins to the Derby’s. Richard Derby had connected his son’s brick house on Derby Street to the Hodges house on Essex and Orange by tunnel. It was built upon Elias Hasket Derby I marrying into the Crowninshield family. Also Choate will become president of the Salem Athenaeum much like the famous subscriber Edward Augustus Holyoke. In 1882 John Kinsman built the building in which houses the bar Opus now. George C. Lord, the son of David Lord who had built many homes in Salem connected to the tunnels, would build the block. Kinsman was married to his sister. He would have 5 tunnels connect to the rear of the building and one that led to a secret train station within the railroad tunnel. Further up it was rumored that the railroad tunnel had another secret station for the judges on Federal Street to use. The current railroad tunnel built in 1950 has a stop for prisoners to enter the district court through a fire escape ladder into the building. To this day Salem Green has not been developed because of these tunnels entering the Kinsman Block . So now the reason for the covered section of the Eastern railroad tunnel is exposed. Imagine this; the mill cities to the north are expanding along with Boston, Providence, and Fall River. They need raw materials to build their city and to manufacture into finished goods in their mills. What better way to receive these than getting them through the tunnels from the sea to the train without paying customs? By 1882 Kinsman has learned from these mill owners to run these tunnels on an assembly line of thought. He built a well organized hub in his building to facilitate the ancient art of smuggling into the modern age. Plus the Crowninshield and Derby families kept up with the times as well. Their families profited through the ages by transporting finished goods from port to port. It was not a big change for them to transfer them now from station to station. Tunnel leading from Kinsman Block to secret train Station under Washington Street. One of 5 sealed tunnels in the back of the Kinsman Block which was converted to a stairs to access Salem Green by removing the top of the tunnel in the process. So Salem kept up with the times of transporting goods. They now could move cargo from China on the Sea and then move it through the tunnels to the train to access the interior of the country without paying any duties. Imagine what else they could of smuggled throughout the country? The sky is the limit! It is said Kinsman was also an Oddfellow. They would sneak in the middle of the night and deliver aid to poor families and hold fast to their anonymity. Which brings us to the second underground in Salem. The Underground Railroad. Could residents in town have been a little nefarious? If you were moving freed slaves through the tunnels in Salem and had a secret train station, would you use this opportunity for your benefit and have a cheap labor force in your mills? A labor force that could not complain about conditions or wages for fear of being sent back into slavery? Just a supposition… I have not read anything about it. For more about the tunnels in Salem read Salem Secret Underground:The History of the Tunnels in the City. Also you can venture on the route of the tunnels and learn their history first hand by going on one of Salem’s best walking tours there is! The Salem Tunnel Tour offers tours at various times throughout the week. Check them out today!